New Wodehouse readers sometimes ask which of the Jeeves stories they should read first. Opinion on the matter is divided; some people recommend ‘Carry On, Jeeves’ (1925) whereas I suggest ‘The Inimitable Jeeves’ (1923). Both are excellent. The question is a matter of chronology. This piece explores these starting points in more detail. Readers looking for a more complete reading list, with suggestions for getting started, may find this reading list for the Jeeves and Bertie Wooster stories helpful. Carry On Jeeves (1925) is a collection of short stories, beginning with ‘Jeeves Takes Charge’, in which Jeeves enters Bertie’s employment, cures his hangover, and disentangles him from an engagement with the unsuitable Florence Craye. This is followed by several stories which had appeared in an earlier collection called ‘My Man Jeeves’ (1919). Set mainly in America, the original stories featured a chap called Reggie Pepper. In Carry On Jeeves, Wodehouse revised the stories to include Bertie Wooster, who had made his debut in ‘The Inimitable Jeeves’ (1923) and firmly established himself as a narrator. However Carry On Jeeves also includes new stories that follow on from events in The Inimitable Jeeves, ‘The rummy affair of old Biffy’ and ‘Without the Option’. Both feature Honoria Glossop and her father Sir Roderick, the eminent ‘nerve specialist’. One of the things that get this old crumb so generally disliked among the better element of the community is the fact that he has a head like the dome of St. Paul’s and eyebrows that want bobbing or shingling to reduce them to anything like reasonable size. It is a nasty experience to see this bald and bushy bloke advancing on you when you haven’t prepared the strategic railways in your rear. These Glossops are notorious among Wodehouse readers, but unless you’ve read ‘The Inimitable Jeeves’ you won’t have met them. 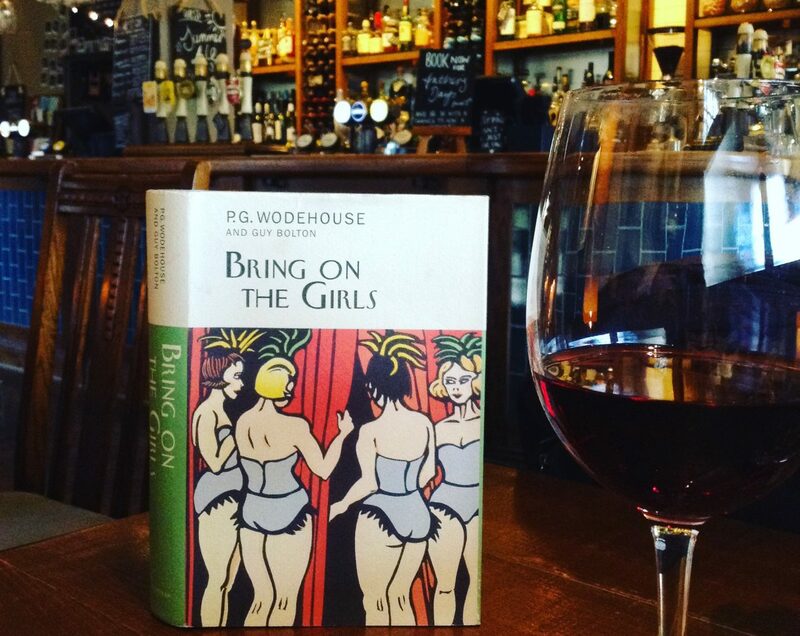 Although Wodehouse can generally be enjoyed out of order, these particular stories are better if you’re familiar with the characters already, and ‘The rummy affair of old Biffy’ gives away the plot of the earlier story. There are similar issues with ‘Clustering around young Bingo’. This is a very successful reworking of the Reggie Pepper story, ‘Rallying Round Old George’. George has been replaced with young Bingo Little, whose love life featured heavily in ‘The Inimitable Jeeves’. If you read ‘Carry On, Jeeves’ first, you’ll find out who Bingo eventually marries. This may not spoil your enjoyment of ‘The Inimitable Jeeves’, but it will spoil the surprise. Chronologically, the events of ‘The Inimitable Jeeves’ take place sometime between the first and the sixth chapters of ‘Carry On, Jeeves.‘ But it would be pedantic and unnecessary to read the stories in that order. ‘The Inimitable Jeeves’ makes an excellent introduction to the saga because no prior knowledge is required to enjoy and fully understand the stories. There are no plot spoilers or references to past events. Reading ‘The Inimitable Jeeves’ first won’t diminish your enjoyment of ‘Carry On, Jeeves’. 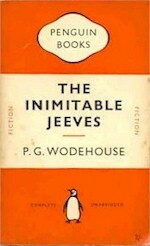 ‘The Inimitable Jeeves’ also introduces many of the saga’s recurring characters. For modern readers who are unaccustomed to reading short stories, ‘The Inimitable Jeeves’ is also a more seamless collection than ‘Carry On Jeeves’. 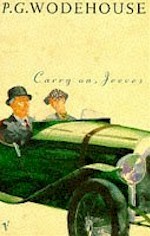 The stories, mostly published during 1922 in Cosmopolitan (US) and The Strand (UK) magazines, are more closely interconnected than the collection in ‘Carry On, Jeeves’. If you have a particular mania for chronological correctness, you could begin with the aforementioned My Man Jeeves (1919). Getting your hands on a copy may not be so easy, and as Wodehouse revised most of it for ‘Carry On, Jeeves’ there really isn’t much point. This is a volume best left for the Wodehouse fanatics (the ranks of whom, you may soon be joining). At the risk of complicating things further, a purist might scoff at the sort of slacker who begins with My Man Jeeves, when the first Jeeves story, ‘Extricating Young Gussie’, was published much earlier, in 1915 (not to be confused with the other ‘first’ Jeeves story, ‘Jeeves Takes Charge’, which was not the first written, but recounts Bertie and Jeeves’ first meeting). ‘Extricating Young Gussie’ appeared in the 1917 collection ‘The Man with Two Left Feet‘ and there is some question as to whether the Bertie who appeared here was a Wooster or a Mannering-Phipps. Do read it, if you can find a copy, but it’s not essential reading for the new Wodehouse reader. Perhaps the most common approach to reading Wodehouse is to start with whichever book you happen to chance across and be perfectly content to devour the rest of them in whatever order you seize upon them. Many people have read Wodehouse this way, especially those of us who collected our books second-hand in the days before internet booksellers and modern reprintings of his work. So to the modern reader seeking advice, I recommend ‘The Inimitable Jeeves’, but it’s advice you should feel free to ignore. What ho, Swongs! I do agree. The modern reader has the luxury of choosing where to begin, but it’s all, wonderfully, Wodehouse! As ever, a sterling summation of things Wodehousian but I would add just two cents worth of change: Both the Everyman reprints series (UK) and, for sure, the Outlook Press reprint series (US) have almost every past hardbound Wodehouse book now back in publication, I believe. So a copy of My Man Jeeves is available for a reasonable, new book price on both sides of the pond. The way Plum “worked” his words to maximize the income from each mot juste is almost as amazing s the words he so carefully selected to use in the first instance and to see the self-editing as things were reused in different formats is an author’s education. Hi Ken. that is good to know. I quickly searched for My Man Jeeves and didn’t see it, but I am really pleased that the new editions are covering his full printed works. If only they’d started ten years earlier… They are marvellous – it will be a great help for new readers who want to discover Wodehouse, which is really terrific. Thanks for the kind words, too. A check just now to confirm my assertions tells me that I should have said The Overlook Press and Everyman’s Library, these computers, in addition to being pushingly “helpful” as they try to spell words for you are annoying particular when you leave off a few bits of the sought for word. Thanks Ken. I need a new copy of this myself, so I’ll look out for it. Happens to me all the time Ken. I began with “Right ho, Jeeves” and usually recommend that to newbies. If people like that, then I put them onto “The Inimitable Jeeves,” telling them to go in for a bit of deferred gratification by keeping “Code of the Woosters” in the wings. What Ho, Paul. That sounds like a sound course to me. From there, they can also try The Mating Season – one of the best. I really enjoy it. Hope you do too. Speaking of Code of the Woosters (although when is one not speaking of Code of the Woosters? ), have you yet delighted in this dramatization? It’s abridged, and slightly adapted, but to my mind it’s pitch perfect. Martin Jarvis does the perfect Jeeves (I prefer his Jeeves here to his audiobook Jeeves). In the vast ocean of mirth left behind by him, one may dive in from any side; the bliss realized is of the same kind! Thanks again for such a lovely post. May I take the liberty of reblogging?! It really is my pleasure Ashokbhatia. Please do share if you’d like to. Following the advice given, I started with “The Inimitable Jeeves,” and I’m glad I did. I enjoyed it a little more than “Carry On, Jeeves,” and overall the books develop better that way, especially for excellent minor characters like Sir Roderick Glossop. I am especially grateful for the advice because I’d never been able to get into J&W before. I just needed to start at the beginning! Chris, this is wonderful to hear. My favourite in the series is The Mating Season. It needs to be read a little later, after The Code of the Woosters preferably. I’ve read it many times and still laugh out loud. However, Wodehouse wrote so much beyond this series to enjoy so if you find it’s not quite your cup of tea, something else might well be. Thanks so much for letting me know how you got on with The Inimitable Jeeves. I really appreciate it. For the last few years, I have given ‘the gift of Wodehouse’ to introduce work colleagues to Wodehouse at Christmas. Although I always try to make selections with the Psychology of the Individual in mind, I do feel The Inimitable Jeeves is a great place to start. I remember buying by first PG Wodehouse (Carry on Jeeves as it happens) at a tender age – probably about 10 or 11 as I had heard it was hilarious. Well I tried and I tried but I just could not get the humour. So I left it languishing on a shelf until well into my thirties when I stuffed it into a suitcase for some holiday reading. How pleased am I that I did. One of the best holidays I ever remember. And then experiencing the additional thrill that I had a further 96 PGWs to work my way through. That’s a wonderful story. It reminds me of my failed attempts at reading Terry Pratchett– until one day we just clicked. Thanks for the reminder – I have the inimitable Jeeves on my bookshelf, and now it’s by my side. Reading more Wodehouse is on my new years resolution list. A great recipe for a happy new year, Susan! I was wondering if there is any way to figure what Wodehouse books were used to make the IV series–with Laurie and Fry. I noticed some seem to have more than one story intermingled in one only episode. Any sugggestion? That’s a good question. I will have a look and see what I can do, Mila. Last night we were watching episode 6 of season 3 (Aunt Dahlia, Cornelia and Madeline or, Comrade Bingo). Suddenly there is Bertie with brown paper and a can of treacle gliding down the stairs en route to a window in the dining room, an absurd idea, suggested by none other than the always brilliant Jeeves. But if memory serves me right, in Joy in the Morning, this is Boko’s idea… The scene was a slap-stick that made me ground my teeth: I read Joy in the Morning and what a wonderful book it was. It amazes me that that imbecile director, Ferdinand Fairfax, got a perfectly written book, a gem such as this by PG, and thought he could make something better of it. The gall of some people, indeed! Yes, I felt that way about the Blanding Series. Not to defend the often tone-deaf TV producers (especially of the Blandings series) but structurally it’s easy to see why they would behave the way they do. Plum’s word-play just doesn’t get across, unless it can be written in the dialogue, so they have to rely on the plots and, as these are similar (the same, say some) from story to story and written in scenes, it’s easy to take the best scenes and shuffle them around with suitable bridges and all comes out right at the end. It is a frustrating travesty, I agree, and particularly so when they don’t get the casting right (e.g. Timothy Spall as Lord Emsworth). Much more successful in my not comprehensive viewing are the dramatised short stories. These are all tightly contained with only one plotline and are filled with simple characters with straightforward motivations. The Reverent Wooing of Archibald with John Alderton as Archie Mulliner and Pauline Collins as Aurelia Cammarleigh springs instantly to mind. Lots of good for TV slapstick action — Alderton’s turn as the laying hen is hilarious. I could go on but merely invite others’ thoughts on, for me, the mostly unsatisfactory translations of PGW to the screen (Stephen Fry notwithstanding). I greatly enjoy the Wodehouse Playhouse series, BBC Heavy Weather movie, and Fry and Laurie’s Jeeves and Wooster. When it comes to adaptations, I’m not a purist. I have no objection to liberties being taken — for the reasons Noel suggests — provided they are in the spirit of the original material. If Wodehouse shoves in a scene involving a chap imitating a hen laying an egg, you are entitled to let yourself go. In each of the above examples, I feel the overall balance was right and the material was well handled by the cast members, many of whom had a genuine affection for Wodehouse. Given the quality of these examples, I had high hopes for the BBC Blandings series. To be clear, I am talking about the recent series featuring Timothy Spall — not the BBC movie ‘Heavy Weather’, which I loved and have watched many times. Briers and O’Toole were both Wodehouse lovers, and the supporting cast is outstanding — I think it makes a difference. If the BBC Blandings series was put together by people with an appreciation of the Wodehouse material, it didn’t show. I tried to watch Blandings Castle, but from the first scenes Richard Briars and Peter O’Toole were so idiotic I couldn’t stand it. I’m sorry to hear that –I loved them in the Heavy Weather adaptation. The show I couldn’t watch was the Blandings TV series. I didn’t know about the Heavy Weather film, so I just downloaded it and watched it. A pretty good job, I thought, given the interpolations. I laughed out loud, which is usually a good guide. I am so pleased you found it and liked it, Noel. I certainly enjoy it — great casting too. I thought there was a book that featured jeeves without bertram, but i cant remember what it was called. i discovered pg w when i was 10 searching the humour section of my local library. That was 60 years ago. A lifetime of laughter. Such a blessing. Yes, you are right Adrian. The book without Bertie is called ‘Ring For Jeeves’. Two BBC adaptations that have all but vanished now are the 6O’s Jeeves & Wooster and a Blandings series that starred Sir Ralph Richardson as Lord Emsworth. Only a couple of the Ian Carmichael / Dennis Price Jeeves & Woosters have survived (you can find them on YouTube I think) I remember this series from my youth. Of course, much of it went over my head but I remember enough of Dennis Price’s performance for him to have become “my face of Jeeves”.. Steven Fry was very good but, by his own admission, he was a bit young for the part when Fry & Laurie made these shows. Ian Carmichael, on the other hand, is less convincing as Bertram. I’d forgotten, until the YouTube repeat reminded me, that Bertie was saddled with a stammer throughout all those shows. The Blanding series has completely gone forever. I never saw it. It was only one series so I guess that would have been 6 x 30minute programmes broadcast around 1969. Anyone remember anything about them? Thanks so much for this. It is a great shame about the Blandings series being lost forever. I have several Penguin paperbacks with covers from that series and wish I could have seen them. Like Stephen, Dennis Price has always been Jeeves to me and I liked Ian Carmichael as Bertie — he was bit old for the role by then but, as he’d played the incompetent young wastrel role so many times, I thought he had all the mannerisms and phrasing of the type down pat. Stephen Fry was too expressive as Jeeves and inserted himself in the action too much; Hugh Laurie overacted. I can’t imagine Rafe as Emsworth; Peter O’Toole gave it a good shot but overdid it at times. Timothy Spall was totally miscast. Michael Crawford could have done it, I think, or maybe Richard E. Grant — he’s tall and thin at least.One other thing: I’ve always had the Scottish comic actor Stanley Baxter in my head as the efficient Baxter. And yes, I too still have the paperbacks. In fact The Penguin Mating Season was the first PGW book I ever bought — maybe about 1963 or 4.